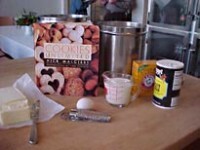 Here is a recipe from Nick Malgieri who taught for many years at Tante Marie’s and has written many marvelous cookbooks. 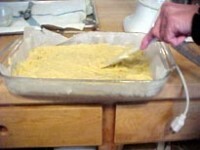 Butter a 9 x 13 x 2-inch pan and line the pan with parchment. Butter the parchment as well. Measure the flour, nutmeg, baking soda, and salt into a mixing bowl and stir well to combine. In the bowl of an electric mixer, beat the butter and sugar together, using the paddle attachment on medium speed. Beat in the egg and continue beating until the mixture is smooth. Lower the mixer speed and beat in half the dry ingredients. When this is incorporated, slowly add the buttermilk and beat until smooth. Then beat in the rest of the dry ingredients. Remove the bowl from the mixer and stir the batter well with a rubber spatula. Scrape the batter into the prepared pan and smooth the top evenly. Bake the cake about 25 to 30 minutes, until well risen and a light golden color, and a toothpick or small knife inserted in the center emerges clean. Remove from the oven and cool on a rack for 10 minutes; then, using the paper, lift the cake from the pan onto a rack and let cool completely. To cut the bars, use the paper to transfer the cake onto a cutting board. 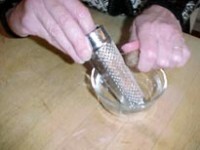 Slide a long knife or spatula under it to loosen the paper, then pull it away. Cut the cake into 2-inch squares. They can be kept in a tin or frozen.